Simply put, BlueStar ranges are extraordinary. Want to cook restaurant caliber dishes right at your home? As the go-to brand for many all-star chefs, a BlueStar range delivers you all the power, precision, and control you can dream of. With high BTU Nova burners, a 1850F infrared broiler, and a spacious oven that can accommodate even a commercial baking sheet, there's no limit to what you can create. 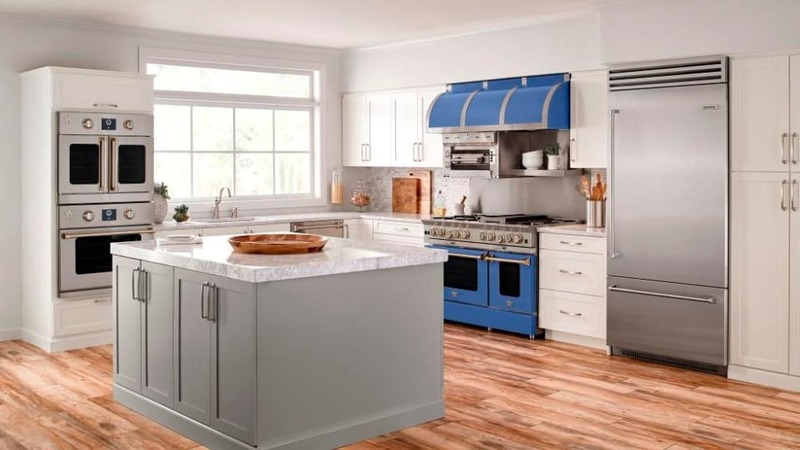 BlueStar puts out around 40 different ranges – and that excludes the color variations. Due to this plethora of options, many people (including the sales staff) get overwhelmed. Therefore, the goal of this review is to highlight the main value points of BlueStar stoves and to translate the internal manufacturer jargon into plain English. We even prepared a video with great visuals so you can make your stove selection with confidence. With BlueStar ranges, you have the power to transform your kitchen into your magical realm and yourself into the hero. Gallantly prepare healthy dishes for you and your family and revel in the glory of keeping your loved ones happy and in good health with the most delicious food. BlueStar's unique burners give you not only precise control but also power that ranges from 15K BTU to 25K BTU. In addition, the infrared broiler is hands down commercial quality. Many swoon when they hear about BlueStar's customization options. You can customize the entire range from the trims all the way down to the knobs. Choose between dropdown or French doors and set up burner configurations exactly how you want them – even choose between open or sealed burners. Into custom colors? Send a swatch to BlueStar and their factory will whip up a stove just for you in that color. You can even tailor the ventilation: the high-performance BlueStar hood can be customized from the coloring to the spacing of the rivets and bands. All items handmade in Pennsylvania, as BlueStar has done since the 1880s. Apart from ranges, BlueStar makes excellent commercial-quality wall ovens. You might want to check out especially popular French door ovens. BlueStar has also started making built-in refrigerators that compliment the rest of the line-up. The PowR Oven feature is unique to the Platinum Series. Raise your hand if you get impatient while waiting for your oven to preheat. We know. PowR Ovens preheat 40% faster than your average, everyday oven. You'll notice a convection fan surrounded by a gas heating element and igniter on the back of these ovens. During preheat, this power burner is on at full force. While you are cooking, you will notice the igniter activating from time to time to help keep the oven temperature consistent. The blue indicator light, located on the front control panel, will turn on every time the power burner is on. There are no additional heating elements at the bottom of Platinum Series ovens – just the power burner and the 1850°F infrared broiler. Many people ask us if a PowR oven will change the cook time of their recipes. We always recommend using the temperature guidance on the recipe as a starting point. In general, lighter or smaller dishes (cookies, muffins, thin layer cakes) maintain the same amount of time as your traditional recipe. However, denser dishes will cook faster in a PowR oven. PowR Oven is available only for the Platinum Series, and this revolutionary technology gives you 40% faster preheating and 30% more efficiency. The unique True European Convection oven system and professional-grade 1850°F infrared broiler help you get all the power of a commercial kitchen in your own home. Additionally, the extra-large oven interiors can accommodate full-size 18” x 26” commercial sheet pans for if you're planning on having lots of guests over. The UltraNova burner lets loose 22,000 BTUs of cooking power and is perfect for a quick boil, high-heat sear, or perfect sauté. The 130° simmer burner easily melts chocolate and can gently warm delicious sauces and soups. You can use integrated wok cooking on any burner, and BlueStar burners and full-motion grates are porcelain-coated cast iron, ensuring durability. Available only for the Platinum Series, the 25,000 BTU PrimaNova burners deliver high, concentrated heat – perfect for searing or boiling water super fast. The 22,000 BTU, 18,000 BTU, 15,000 BTU, and 130°F simmer burners give you even more control and precision. The unique BlueStar open burner system ensures maximum efficiency and provides intense heat evenly distributed across the bottom of the pan. You have so many choices! There are more than 750+ colors and 10 metal trims (including brass and copper) that allow you to tailor your oven to fit the exact look you want in your kitchen. What are the benefits of a French door oven? Here's the best thing: you won't risk burning your elbows as many professional chefs do with conventional dropdown door ovens. BlueStar ovens easily fit full-size commercial sheet pans so that you can bake all the things you want quickly and efficiently. The unique oven baffle design and fan system result in even heat distribution for precise, accurate baking. Plus, our 15,000 BTU infrared broiler produces 1850°F of intense searing heat, enabling you to broil to perfection in a flash. What is a French top cooktop? It's 24x24 of heavy flat cast iron or rolled steel with a high-powered gas burner is under the flat top. The center of the top typically has an 8 to 9-inch removable ring with additional rings surrounding it. The center ring is the hottest location and can be removed for high-temperature cooking with a wok. The heat weakens as you move away from the center ring, so the outer ring area is good for simmering soups and the outer edges are perfect for melting butter and chocolates. The real advantage is to simmer and hold temperature. Cook multiple items without multiple burners because each area has a different temperature. Because the tops are cast iron or rolled steel they need to be seasoned to stay clean (just like a griddle). Because the burner is under the steel itself, it can be hard to know when it's on without looking carefully at it. The extra-large convection oven comes with an 1850°F infrared broiler that accommodates a full size 18" x 26" commercial baking sheet. There is also a precise 130°F simmer burner. The Platinum Series comes in six unique colors: Infused Copper, Statuary Bronze, Ginger Spice, Enchanted Silver, Enchanted Sand, and Matte Black. All champions need the right tools. And while BlueStar provides a huge array of choice and customization, we have a few picks that we think are the best value for you and your family. This range comes equipped with the restaurant style 15,000 BTU Nova™ open burners and the precise 130°F simmer burner. It also enables integrated wok cooking with no wok ring required. The convection oven is extra large, and with an 1850°F infrared broiler that accommodates a full size 18" x 26" commercial baking sheet, you'll never be short of power. This model, however, is available in stainless steel only. Need a little more power? With 22,000 BTU UltraNova open burners, you'll boil water in a flash, sear meats like a pro, and sauté all day. This model also comes with the precise 130°F simmer burner, so you can melt chocolate and keep all your soups and sauces hot. Integrated wok cooking is available on any part of the stove. The extra-large convection oven fits a 18" x 26" commercial baking sheet and with a mega-powerful 15,000 BTU 1850° infrared broiler you can to broil to perfection in just a matter of minutes. Choose from all burners or add an integrated griddle, charbroiler or French Top. This model is available in 750+ colors & finishes and has choices of door options. The Excalibur of ovens. With 25,000 BTU PrimaNova open burners that are only available on the Platinum Series, you'll have the power of any commercial kitchen at your disposal. This model comes with eight burners: 22,000 BTU, 18,000 BTU, 15,000 BTU, and a 130°F simmer burner. With the this model's innovative Interchangeable Griddle/Charbroiler, there is no need to choose between all burners or griddles/charbroilers on your range – you can have it all. Enjoy the ultimate in flexibility: remove 2 burners and place the griddle or charbroiler anywhere on the range. Interchange the two components based on the day’s menu, and enjoy dual zone cooking with up to 40,000 BTUs of heat on four unique cooking surfaces. There is also integrated wok cooking. This oven is phenomenal: a true European convection oven that fits 18" x 26" baking sheet. And with PowR Oven, you'll preheat 40% faster and boost your oven's efficiency by 30%. There's no limit to what delicious foods you can create. The BlueStar Salamander Broiler adds a high-performance, commercial quality to your home kitchen. 4 Position Grilling Rack: The four-position, adjustable grilling rack delivers impressive results. From “Pittsburgh-rare” steaks to crispy chicken or delicately broiled crab cakes, you can make your favorite dishes in about half the cooking time. 2 Ceramic Burners: There are two independently controlled 11,000 BTU infrared ceramic burners keeping things hot. Additional Features: There are 215 square inches of cooking space, an automatic electronic ignition, and a re-ignition system. Food is one of the ultimate pleasures in life, a key to happiness, and a major way we bond with our loved ones. As the champion of the kitchen, lionheart of your home, the right tools can help you cook more delicious dishes with less effort. Investing in a BlueStar range isn't just buying an oven; it's investing in maximizing your skills as a chef and prioritizing the health and happiness of the ones you care about most. We noticed that most of our customers who have chosen a Bluestar range aspire to have fun while cooking. Bluestar unlocks various cooking methods for you and helps you maintain culinary bragging rights in the family. Does BlueStar make sealed burner ranges? Yes, BlueStar makes a limited number of sealed burner ranges under the Culinary series. Sealed burner cookting surfaces are easier to clean but most chefs prefer open burners to have better control on the flame distribution. Is the grill or griddle electric or gas? BlueStar ranges feature gas grills and griddles as opposed to other manufacturers in the pro-range circuit. Companies such as Wolf range, Thermador, Viking and Miele feature electric infrared options.